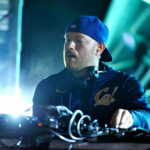 Eric Prydz refuses stay out of headlines this week, following the debut EPIC 5.0 at London’s Creamfields Steel Yard this past Saturday, May 27. Luckily for his global following who were unable to be in attendance, one die-hard Redditor fan captured the breathtaking performance on camera. Today, May 31, the the Swedish progressive house icon has announced that his first-ever EPIC 5.0 set be will re-broadcast in full during a special two-hour episode EPIC Radio. Fans can tune in on Apple Music’s Beats 1 this Friday, June 2, at 3 PM PST.